One 'seasteader' says artificial islands could provide new homes to Pacific Islanders. Illustration of a seastead, modeled after a local flower to honor the Polynesian culture. Photo courtesy of Joe Quirk/Seasteading Institute. 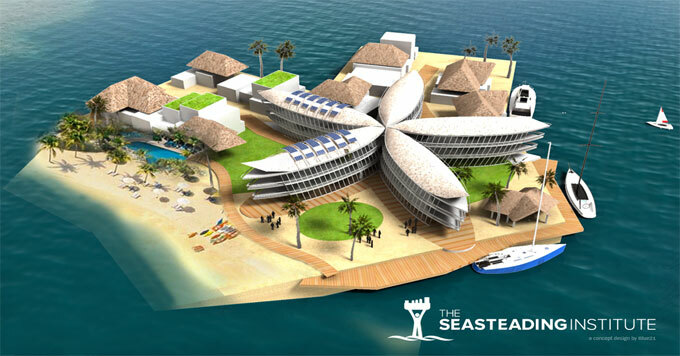 As its first project, the Seasteading Institute plans to build a cluster of island platforms in a French Polynesian lagoon. Quirk says the technology to build the islands exists, and if all goes well, construction will start next year. There’s still widespread skepticism about the feasibility of seasteading, let alone its ability to provide an affordable solution for people displaced by rising sea levels. But as we face a world changed by global warming, projects like this remind us that there are ground-breaking ideas waiting to be explored.